Kepler 10b is not much like Earth. It weighs nearly five times as much, orbits a similar star at a much closer range-closer than Mercury is to the sun-and is hot enough on its surface to melt iron. So it is unlikely to hold life, at least of a kind we could empathize with. But it does confirm that other stars than ours have rocky planets in their solar systems, and given the gazillions of stars out there, it makes it probable that Earth-like planets, tepid enough to melt ice but not boil water, probably exist. It therefore surely follows that the universe must be teeming with intelligent life. After all, life got going here pretty early in the planet's story and has now had time to evolve brains big enough to send radio signals into space. Given that many stars are much older than the sun, many planets ought to have achieved the same result a long time ago. In which case, as the physicist Enrico Fermi famously asked, "Where are they?" Why have we not picked up signals from other civilizations? Somewhere in this chain of logic there must be a flaw; otherwise the airwaves would be crammed with alien chat shows. It was the Brazilian cosmologist Carlos Frenk who told me of a flaw that his colleagues see. Life started early in Earth's history, yes, but it took a long time for us to achieve big enough brains to get technology started. This was because evolution takes time and needs stability. The Earth has had its share of instability. The most sophisticated life forms kept getting knocked out by catastrophes, of which the near-total extinction of all life at the end of the Permian period and the extinction of the dinosaurs at the end of the Cretaceous are only two recent examples. But actually, the Earth is an astonishingly stable planet. For four billion years, it mostly has maintained not just a similar climate and a similar orbit but a similar rotation pattern, too. We have the moon to thank for this, Mr. Frenk says. Our unusually large satellite helps to keep us on an even keel. Without it, we would get occasionally tumbled by the influence of Jupiter. But the moon's birth (blasted from our own surface by an asteroid collision) was a highly improbable event. A bigger collision and the Earth would have been smithereens; a smaller one and the debris would have fallen back to Earth rather than coalesce as a single moon. 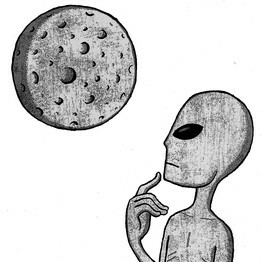 So here's the flaw in the Fermi paradox: The birth of a moon just the right size to stabilize a rocky planet's orbit and rotation is very improbable. And Australia? Australia has an unusually unstable climate. It can be sure of getting terrible floods and droughts, but it cannot be sure when. This made it unsuitable for early agriculture, which is why aborigines sensibly did not invent it (as their New Guinea neighbors did when their climate became more stable after the end of the last ice age). This circumstance made it difficult for Australian hunter-gatherers to form the dense demographic concentrations that gave rise to technological civilization through specialization and the exchange of ideas. If Earth's climate had remained as unstable as Australia's, and as unstable as it was all over the planet during the last ice age, then the radio would never have been invented and the Earth would still be silent. Stability is key.